Now this is cool... I have never seen a Singer Gazelle station wagon ("estate") in the US before. The Gazelle was an upmarket version of the Hillman Minx. It is one of Rootes' "Audax" cars. The Audax cars - The Gazelle, Minx and also the Sunbeam Rapier - were designed with input from American designer Raymond Loewy. It was Rootes' first unibody design. Singer was acquired by Rootes in 1956. The first version of the Gazelle had a Singer engine in it. In 1957 they came with Rootes' marginally more powerful 1390cc engine. This Gazelle estate was part of an estate. It was last registered in 1992. According to the seller, except for "missing front headlight trim", it's complete . Everything that should move, open, close or turn, does so. The Audax cars were known for ferocious rust and this car, even though it's spent it's life in California, is showing some rust. None of it looks too serious and by Rootes Audax standards, this is a clean car. This car needs a total restoration. But, starting with a fairly complete car is a huge plus. Rootes parts, especially body and trim parts, are not easy to come by these days. If I had the space, money, time and talent required to restore this car, I'd be all over it. 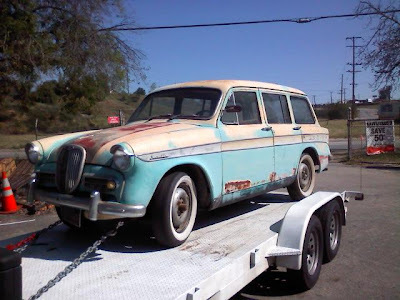 This will be a great looking car when restored and a hit at any British car show. Located in Yucaipa, CA, click here to see the eBay listing. I'd say a car in this condition is a heart-strings purchase. If it had been a Sunbeam Rapier, there's a small chance I'd be the idiot to consider (obviously not the same as diving in... but still..) buying it. My long past parents had a Sunbeam Rapier for a short time (and hated it with a passion) before they bought a Borgward which they adored. That alone makes me curious. So, I'll agree, it's a purchace that only a niche group would want, but ain't the world wide web a great place for possibly making a connection? Fingers crossed for this old relic. It sure has potential. rrshadow - You're right. But, the hope is that someone who has the time, talent and money will restore it not for profit, but just because it's cool and unusual. Waaay too many cool and unusual cars have wound being scrapped because no one saw a profit in restoring them. IMO, that's what's making car shows less and less interesting these days and, in part, is what is killing the old car hobby. HI! I would like to introduce myself as the idiot that would buy this car. In fact, I did put a bid in on it. I am the guy that really doesnt have the money but I do have the skill and desire to restore this car to its former glory. I currently have two goggomobils, a '58 and a '59. Ive been restoring for 27 years and when I started, there was no internet and finding parts locally meant you simply could not restore a car like this. Thanks to modern technology, these way cool pieces of history are restorable. Anyway, we will see what happens on this beauty. Anon - Good luck! It would be a great car to see restored. Keep us posted! If you are interested we have a 1959 & 1961 Singer Gazelle Station Wagon. Both are being sold together. One engine was in running condition when stored. The other nees a new head & cams. With these cars the new heads, cams, & other misc engine/car parts.